The first group are mainly plastic encased and difficult to find a place to get an earth connection. Typically items such as fans, flat screen monitors and shredders fall into this category. The most useful piece of test equipment in this case is a long reach probe. Most modern test instruments use a standard 4mm test lead with a crocodile clip. These can easily be replaced with a 4mm probe. It may take a bit of practice at first, but you can quickly learn where to find an earth connection using a probe. 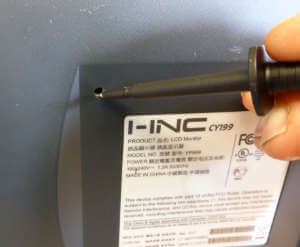 An earth connection can usually be found on flat screen monitors and TVs by using a probe on the threads on one of the four mounting holes on the back. Obviously you need to be careful that you don’t put the probe too far into the hole and risk damaging the monitor. An earth reading can usually be found on the motor casing of a Class 1 fan. You will need a long reach probe to access it through a vent on the back. An earth probe is also useful for items like this coffee percolator. The earthed metal hotplate is cover by a thin paint or non-stick coating. 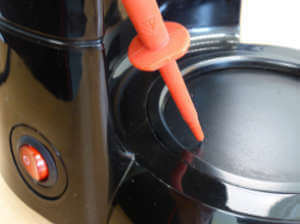 Use a sharp probe in a discrete area to pierce through the coating. In the second group are power supplies and chargers used for equipment like monitors and laptops. They are earthed but only for screening the electronics, not for electrical safety. 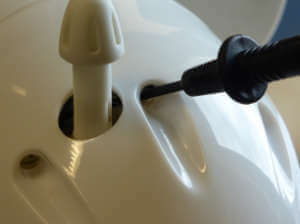 Protection from electric shock is provided by double or reinforced insulation. However the manufactures can not use the Class 2 symbol because of the earth connection. “If an appliance with double or reinforced insulation throughout has provision for earthing, it is considered to be a Class I or Class 0I appliance.” IET Code of Practice. It is usually possible to get some kind of reading from the dc plug on the end of the charger, however because the earth is not designed to carry any fault current, it is of a very small size and is likely to give misleading readings. A series resistor is also often used between the input earth and output dc. For this type of power supply, omit the earth continuity test and just carry out the Class 1 insulation and leakage tests. Don't use the Class 2 setting on your PAT tester. Although the limits are set higher for Class 2, the tests are referenced against the test lead, so a touch current test may be carried out rather than an earth leakage test. For PAT instruments with user programmable test sequences, it’s worth programming a Class I test especially for this type of equipment. Many of these power supplies have detachable leads; in which case it should be tested separately using a standard Class I lead test. 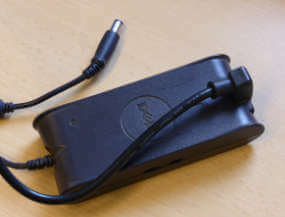 The IEEE (Institute of Electrical and Electronics Engineers) have recognised the problem with PAT testing these power supplies and introduced a new symbol especially for this type of equipment in 2011. The symbol is a combination of the familiar double insulated, square within a square symbol, and the existing symbol for a functional earth. The new symbol is now on the IEC/ISO database of approved graphical symbols for use on electrical equipment. IEC 62368-1 has also been modified to include the use of the new symbol. IEC 62368-1 is the latest international safety standard for audiovisual products and information technology equipment. It is expected that this standard will eventually replace IEC 60950-1 (safety of ITE). So hopefully this symbol will start to be used on laptop chargers and similar equipment sometime in the near future. The third type are Class 1 items that simply do not have any accessible earthed metal. This type of equipment is relatively uncommon and it’s worth double checking for the Class 2 symbol again. An example recently encountered was a pressure washer. Most are Class 2, however some of the more industrial types can be Class 1. Its usually possible to get an earth connection on the metal hose connections. In this case the hose connections were plastic and the entire unit was plastic encased and water tight. After carrying out a visual inspection and making sure it was being used with an RCD, the only option was to omit the earth continuity test and just carry out the Class 1 insulation and earth leakage tests. A note was made on the inspection & test records indicating that the earth continuity test was not carried out and the reasons why. In this case, the key word here is ‘exposed’. The requirement is is test the exposed metal a user could come in contact with should a fault occur.